Okay, I’m going to say it — I think it’s finally autumn here in New York. I just checked the weather forecast and it looks like it will not be above 69º for the next week (knock on wood!) and that means autumn to me. I mean, it’s about time, right? October is almost over! Another thing that just screams autumn for me is jewel tones. Burnt oranges, deep burgundies, lush emeralds, and silky onyxes are all I want to see and wear this time of year. 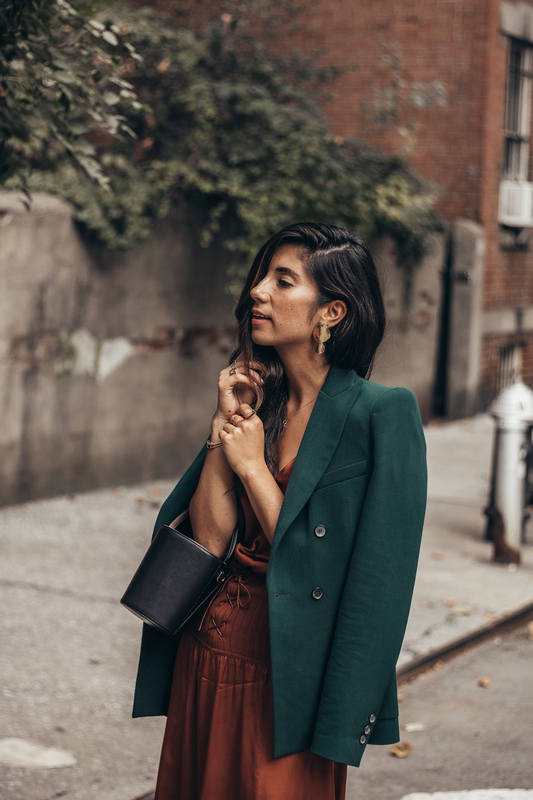 I love how they can seamlessly transition from lovely day pieces into sultry date-night outfits, like the ensemble Krystal pulled together here, featuring this stunning Le Fou Wilfred dress from Aritzia. 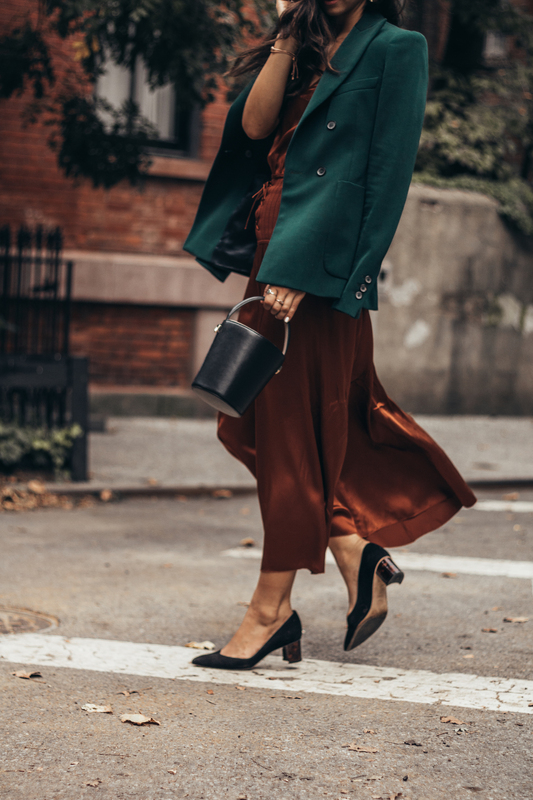 The color is so autumnal, and yet can be worn throughout the holiday season (Thanksgiving dinner, anyone? ), and the richness of the fabric shines as the nights get longer. Style and friday favorites, nora. Love that color combo of forest green and burnt rustic orange. So gorgeous! I love a good neutral but am obsessed with the gorgeous jewel tones this fall! The color combo is beautiful and I love that it’s a little unexpected. Perfect face and shoes, and I know that this doesn’t sound really smart but hey! Love this look! 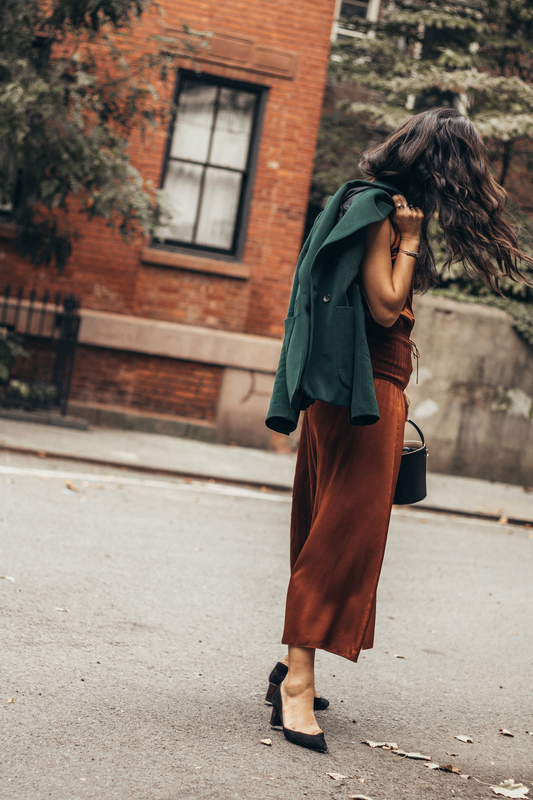 The luster of that burnt orange dress completely elevate this outfit. © 2017 This Time Tomorrow.